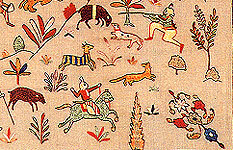 The embroidered art of Chamba rumals emerged in the princely hill states of Chamba, Basoli,Kangra and adjacent areas in present day Himachal Pradesh. 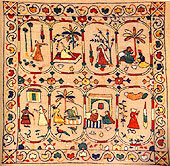 Though practiced throughout the region, it came to be associated with Chamba because of the continued patronage by its rulers and the style and colors of the rumal which were influenced by the miniature painting traditions of Chamba. 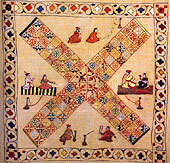 The rumal is the image of the painting in embroidery. It is apparent from the rumals which have existed dating back to the 18th and 19th century that the drawings were made by the miniature artists and embroidered by women of the nobility who developed a high level of sophistication and stylization. 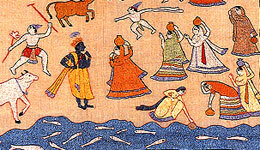 The themes of the rumal were mainly religious, with special favor given to the raasmandal and scenes from the life of Krishna. 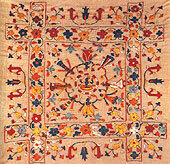 The fabric was usually handspun or hand woven unbleached mulmul or fine khaddar. 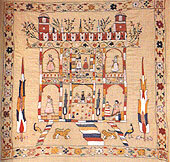 The embroidery was done in a double satin stitch using untwisted pure silk yarn. 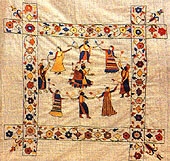 The rumals were used as covers for offerings made at weddings, festive and relegious occasions. To revive the art form by attempting to recreate the quality and finesse of the originals by replicating rumals housed in various museum collections. To launch a sustained revival program which would include training of the craftswomen and a sustained marketing effort. The base cloth used was mill made polyester not the original mulmul or fine hand woven fabric used traditionally. This fabric with its machine finished sheen did not add value to the embroidered piece unlike the hand woven fabric that provided a pleasing dimension. 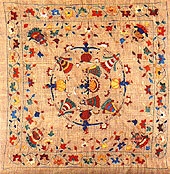 The embroidery thread required was untwisted floss silk. Due to its unavailability the embroiderers were using twisted yarn after untwisting. The effect of this was unseemly. The yarn colours used were garish and lacked balance and harmony. 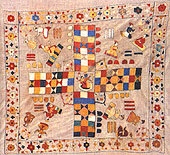 The rumals, no longer inspired by the original patterns were cruder in their design and execution, losing their unique connection with the miniature painting tradition. On the positive side women had not lost the skill of the specialized Chamba embroidery and artists continued to draw the patterns. Embroidery continued to be a popular pastime for the women who now were selling them made on ordinary items like pillowcases etc. Sixteen designs from various museums, including the National Museum, New Delhi, Buri Singh Museum, Chamba, Indian Museum, Kolkatta, Crafts Museum, New Delhi and the Victoria & Albert Museum, London were identified and photographed. 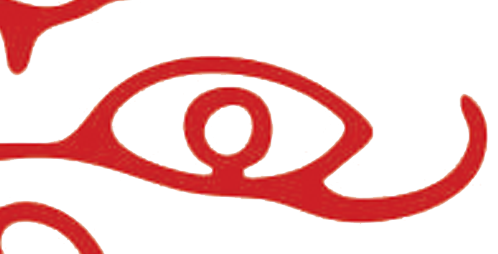 The next step was to source the material used to make the rumals. With changed times and machine made materials having replaced the hand made it was difficult. A close substitute – hand woven fabric/ khadi as the base cloth – was selected. For the embroidery yarn the local markets were scoured. It was a failed attempt to source naturally dyed untwisted floss silk yarn. An alternative of untwisted but synthetic yarn dyed in a wide range of colors was eventually found in a local market in N. Delhi. Now that the patterns, the fabric and the yarn were finalized, a few women embroiderers and a miniature artist in Chamba were chosen to execute the rumals. Due to distance , lack of communication facilities between Chamba and Delhi and initial teething problems the pace of work was slow. However eventually the concept, the quality standards required, the level of excellence expected from the embroiderers and the artist was achieved and over a period of 3 to 4 years,16 rumals were produced. 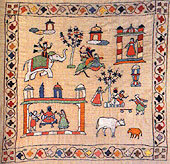 In 1999 the Delhi Crafts Council organized an exhibition of the rumals at the Crafts Museum, New Delhi. The revived rumals were received with universal acclaim from visitors and critics alike. The exhibition was accompanied by a catalogue and an indepth discussion on the future of the rumals and thoughts on the next phase. It was unanimously agreed to maintain the high museum quality standards of the rumal rather then popularize and cheapen it, to promote the rumals as works of art and to accept orders and monitor the production and quality. 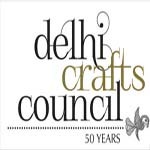 The Delhi Crafts Council decided to take orders on the created pieces. They are expensive and it takes up to 2 to 4 months to make one piece. 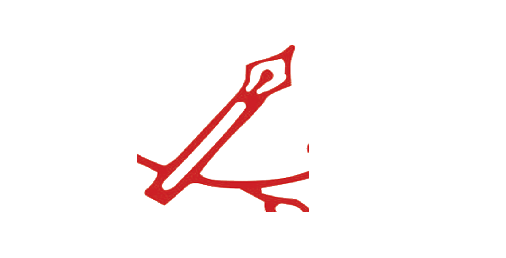 The rumals have been exhibited in important cities like Mumbai, Kokata, Hyderabad, Bangalore, Ahmedabad and others between 200-2004. An important breakthrough came in Mumbai where an order of 20 rumals was placed for a Museum in Surat. Following this demand, the DCC established a Centre in Chamba. They rented one room, hired a person to oversee the work of the embroiders who also initially trained other young girls. The trainees were given a stipend and the embroiderers were paid for their work by the DCC. The Centre is still in the process of evolution and efforts are on to involve local people to take an interest and participate in helping it to grow. The DCC is reexamining their marketing strategy to identify new markets and new methods of distributions of the rumals. Their next attempt is going to be to organize i exhibitions outside the country as well to promote the artistic, social and cultural worth of this exclusive art of Chamba rumal embroidery.